Ramirez: [narrating] From the dawn of time we came; moving silently down through the centuries, living many secret lives, struggling to reach the time of the Gathering; when the few who remain will battle to the last. No one has ever known we were among you… until now. Connor MacLeod: [as Ramirez rows away] Help me, I’m drowning! Ramirez: The sensation you are feeling is the quickening. Connor MacLeod: Who are you? Ramirez: We are the same, MacLeod. We are *brothers*! Ramirez: [after MacLeod misses him with his sword] Crude and slow clansman, your attack was no better then that of a clumsy child. Connor MacLeod: This cannot be, it’s the devil’s work. Ramirez: You cannot die, MacLeod, accept it. Connor MacLeod: [laughs before realising Ramirez was serious] I hate you. Ramirez: Good. That is a perfect place to start. Connor MacLeod: Tell me how’d it happen for God’s sake. Ramirez: Why does the sun come up? Or are the stars just pin holes in the curtain of night, who knows? What I do know is that because you were born different, men will fear you… try to drive you away like the people of your village. Ramirez: You must learn to conceal your special gift and harness it until the time of the gathering. Ramirez: When only a few of us are left, we will feel an irresistible pull towards a far away land… to fight for the prize. Ramirez: If your head comes away from your neck, it’s over! Ramirez: The Kurgan. He is the strongest of all the immortals. He’s the *perfect* warrior. If he wins the Prize, mortal man would suffer an eternity of darkness. Connor MacLeod: How do you fight such a savage? Ramirez: With heart, faith and steel. In the end there can be only one. Ramirez: You cannot die, MacLeod. Accept it. Connor MacLeod: I hate you! Ramirez: Good. That is a perfect way to start. Kurgan: Who is the woman? Kurgan: You can’t defeat me, Ramirez! I am the strongest! Ramirez: My cut has improved your voice! Connor MacLeod: Sheep’s stomach, stuffed with meat and barley. Connor MacLeod: You eat it. Connor MacLeod: I don’t like boats, I don’t like water. I’m a man, not a fish! Ramirez: Oh, you complain endlessly. Connor MacLeod: You look like a woman, you stupid haggis! Ramirez: Patience, Highlander. You have done well. But it’ll take time. You are generations being born and dying. You are at one with all living things. Each man’s thoughts and dreams are yours to know. You have power beyond imagination. Use it well, my friend. Juan Sanchez Villa-Lobos Ramirez: You must leave her, brother. I was born 2,437 years ago. In that time I’ve had three wives. The last was Shakiko, a Japanese Princess… When Shakiko died I was shattered. I would save you that pain. Please, let Heather go. Connor MacLeod: I don’t like boats, I don’t like water. I’m a man, not a fish. Ramirez: So you complain endlessly. Connor MacLeod: You look like a woman you stupid haggis. Connor MacLeod: You eat it! Connor MacLeod: Be still for God’s sake! You’ll tip us over. Connor MacLeod: I cannot swim you Spanish peacock. Ramirez: I’m not Spanish, I’m Egyptian. Connor MacLeod: You said you were from Spain! You’re a liar! Ramirez: You have the manners of a goat and you smell like a dung-heap. And you’ve no knowledge whatsoever of your potential. Now, get out! Ramirez: I am Juan Sánchez Villalobos Ramírez, Chief metallurgist to King Charles V of Spain. And I’m at your service. 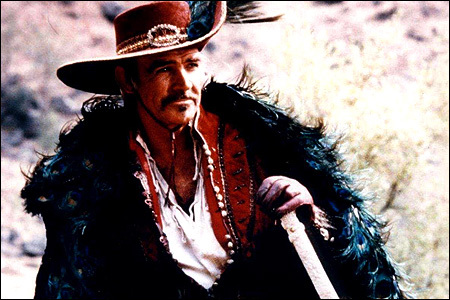 Please share other Connery quotes or any other thoughts/memories you have about the film in the comments below.Thank you for your interest in Sean Connery and Highlander.